Following our guide, Mac users will not face any error. Peoples forget what installed which things and get odd errors with PHPCS. Your everything’s path should be on ~/.zshrc. Otherwise any debugger will fail. I am writing like poet. If you find any error in the poetry please inform me via Twitter. export PATH="/usr/local/opt/icu4c/bin:$PATH" export PATH="/usr/local/opt/icu4c/sbin:$PATH" export PATH="/usr/local/opt/libxml2/bin:$PATH" export PATH="$(brew --prefix homebrew/php/php70)/bin:$PATH" PATH="/usr/local/bin:$PATH" PATH="/usr/local/sbin:$PATH"
Restart VSCode. You should not receive any error. This ends first part of the guide. Second part is about what to do with WordPress. For Arduino you should have Arduino IDE installed as advice for the third part. This Article Has Been Shared 3504 Times! 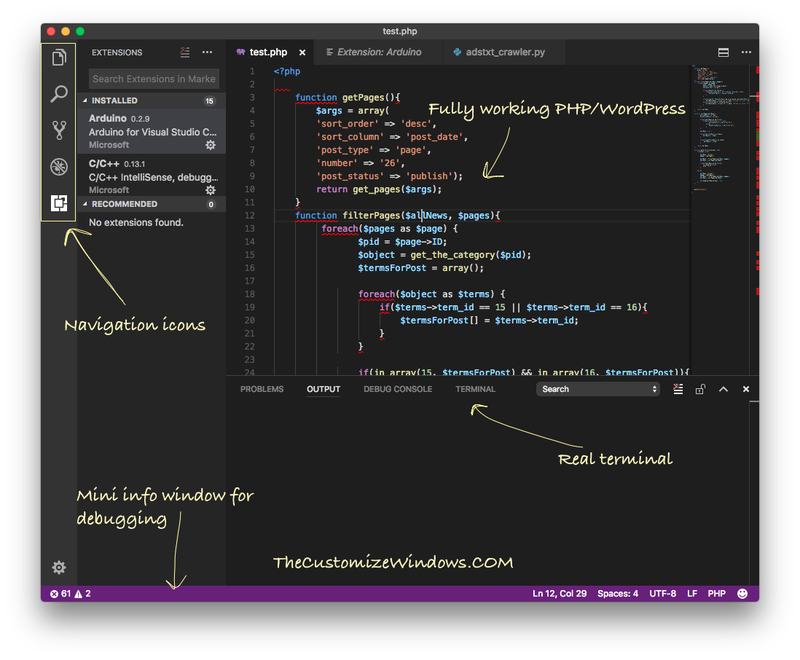 Here is Part 2 of How to Setup Visual Studio Code on Mac For Debugging Arduino, WordPress etc. We Have Shown to Setup WordPress Debug Setup. Cite this article as: Abhishek Ghosh, "Setup Visual Studio Code on Mac For Debugging Arduino, WordPress : Part 1," in The Customize Windows, October 11, 2017, April 21, 2019, https://thecustomizewindows.com/2017/10/setup-visual-studio-code-mac-debugging-arduino-wordpress-part-1/.